Meroveus (Latin: Merovech or Merovius; French: Mérovée; German: Merowig) is the founder of the Merovingian dynasty that later became the dominant Frankish tribe. He apparently lived in the first half of the fifth century. His name is a Latinization of a form close to the Old High German given name of Marwig, which might be literally translated as "famed fight". The first Frankish royal dynasty called themselves Merovingians ("descendants of Meroveus") after him. 1.) Their Sicambrian roots stretch back to the lost Hebrew tribe of Benjamin, which fled Israel following a civil war and voyaged to Greece where they become intermarried with the princes of Arcadia and supposedly helped found ancient Troy. [*] At about the time of the Roman conquest of Greece, these "Benjamites" journeyed north to the mouth of the Danube River on the Black Sea and eventually followed the route west to ancient Gaul, while along the way absorbing into their ranks smaller Germanic groups. [*] This might suggest that Dardanus was either a member of that tribe, or that as an Arcadian prince, he married a member of the Tribe of Benjamin. Such speculation might relate to some very interesting aspects of the Benjamin tribe, namely those depicted in The Twelfth Tribe of Israel. The major implication is that the Sicambrians, among other things, may have been goddess worshipers... Belial (Inanna), Astarte, Demeter, Artemis, and Ursa... the latter the female form of the Latin for “bear”. If one is going to worship a deity, a mother bear would seem sufficiently protective. 2.) Through marriages with Visigoth nobility from southern France and Spain, they descend from the Desposyni (descendants of the relatives the Christ family) that fled the Holy Lands following the crucifixion and who initially settled in southern France. It is particularly noteworthy that all three legends may be true. Accordingly to Wikipedia, one particular story suggested Meroveus as the son of Queen Basina I of Thuringia, Clodion's wife... but that Meroveus’ father was not Clodion, but a sea-god, bistea Neptuni. Furthermore, as the Frankish chieftain, he may have been the namesake of a certain god or demigod honored by the Franks prior to their conversion to Christianity. If such stories did exist, them it is likely that the Christian hierarchy would seek to discredit any historical basis for Meroveus... calling any connections to a god or demi-god the stuff of myths and fantasies. The idea of Meroveus being conceived by the Queen encountering a Quinotaur, a sea monster which could change shapes while swimming... would likely serve the Christian hierarchy’s interests than the possibility of any divine intervention in the begatting process. At the same time, the sea monster bit could also be interpreted as a foreign conqueror, coming from the sea, and taking a dead king’s wife in order to legitimize his rule. In this interpretation, both the history of Meroveus... and possibly his name... could co-exist. Meroveus was simply the son of Clodion of Tourani and Queen Basina I... one of three sons as it turns out. Albaeric (Alberic) Lord of Moselle (c. 430-456) was also known as Lord Albero. His parents were King Clodion le Chevelu, of Tournai and Queen Basina of the Thuringians. 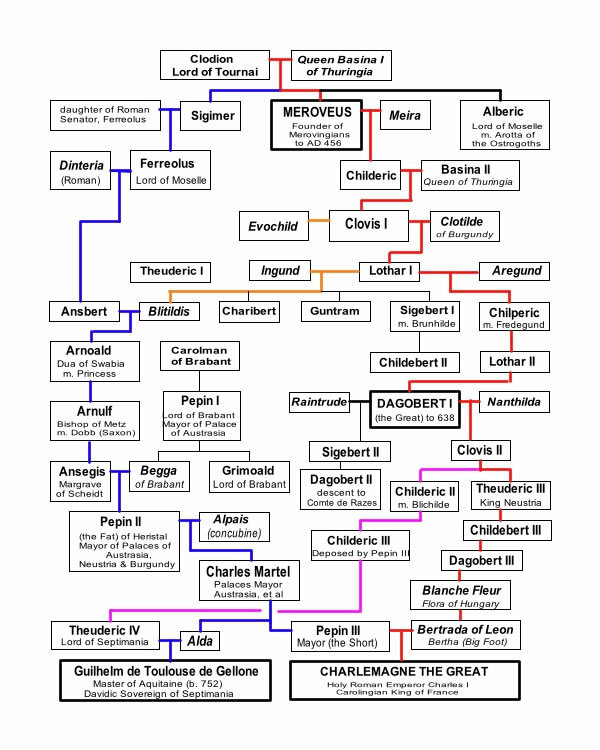 Albaeric married to Arotta of the Ostrogoths, the latter who has her own very impressive family tree (see below). This would strongly imply that Alberic was an important individual. However, from an historical perspective, very little else is known about him. While suffering from being historically deficit, Alberic appears to have done much better in (what is allegedly fictional) literature. In these stories, he was a noted sorcerer, or at least as depicted in the epic sagas of the Frankish Merovingian Dynasty of the 5th to 8th century CE. Therein, his name came to mean king of the elves (elbe "elves" reix, rex "king") [*]. Alberic is also reputed to have possessed the ability to become invisible [with or without a cloak] and was known as king of the dwarves. [*] There is absolutely no confirming evidence that the latter day King of the Elves was someone named Elvis. Being an alleged sorcerer did not lend itself to being eulogized by the narrow-minded religion of the time, despite the fact that said religion would in the near future be giving out sainthoods by the carload to many of the descendants of this particular sorcerer. Sorcerers, particularly those with the power of invisibility and, worse yet, those who associate with -- and possibly contribute to the delinquency of -- short, grumpy miners [as opposed to minors] were not exactly the ideal example for religious aficionados to emulate. On the other hand, wouldn’t it be amusing if Alberic was indeed gifted with the kind of mind that delved into mysteries (like invisibility or dwarf lore, or [gasp!] the genealogy of the Desposyni), said activities being something the Christian religion would deem as satanic, evil, and dastardly? As for Alberic's apparently short tenure of 26 years, was the departure in 456 CE merely a disappearance from history, or a genuine death? One never knows when it comes to sorcerers, elves, and/or dwarfs. In the latter case, possibly he was simply overlooked when it came time to count heads. Curiously, an epic poem in Middle High German, the Nibelungenlied, describes Alberic as a dwarf who guards the treasure of the Nibelungen, but is overcome by Siegfried. Siegfried... someone whose name might possibly derive from Sigimaerus I (of Auvergne)... aka, Alberic’s younger brother, the latter who later became a Bishop. Clearly, for purposes of spin control, public relations, and revisionist history, any church Bishop would be compelled to win any battle with a guardian of the treasure of the Nibelungen, particularly one who delved into sorcery, associated with dwarfs, and so forth and so on... and who was going to be made to disappear... one way or the other. Admittedly, Wagner's Alberic may be a composite character, based for the most part on the Alberic from the Nibelungenlied, but also on Andvari from Norse mythology. Nothing in this, of course, detracts from the possibility that Alberic (aka Albaeris) was not a major player in the scheme of things. The fact that the Catholic Church might have gone out of its way to demean Alberic’s character and heritage -- in its typical manner -- only serves to suggest that Alberic might have been of some major importance. The fact that there are no known offspring or descendants for Alberic only suggests: 1) the effectiveness of the Church’s nefarious agenda to remove his heritage, or 2) such descendants actually don’t exist. And of course, anyone associated with mythology is as likely as any one associated with a history to be a very real, flesh and blood, individual from times past. Sometimes, more likely. Bishop Sigimaerus I of Auvergne was born about 435 in Westphalia, Germany. His parents were: King Clodion le Chevelu, of Tournai and Queen Basina of the Thuringians. Childeric I of the Franks (c. 440– c. 481) was the Merovingian king of the Salian Franks from 457 CE until his death. He succeeded his father King Maerovaee of France as king. With his Frankish war band he established his capital at Tournai, on lands which he had received as a foederatus of the Romans, and for some time he kept the peace with his allies. Audofleda, who married the king of the Ostrogoths, Theodoric the Great. Childeric I first defeated the Visigoths -- who had hoped to extend their dominion along the banks of the Loire River -- in about 463 in Orléans, in conjunction with the Roman General Aegidius, who was based in Soissons. After the death of Aegidius, Childeric assisted Comes ("count") Paul of Angers, together with a mixed band of Gallo-Romans and Franks, in defeating the Goths and taking booty. Childeric eventually took the city of Angers, then followed a Saxon war band to the islands on the Atlantic mouth of the Loire. In a change of alliances, he also joined forces with Odoacer to stop a band of the Alamanni who wished to invade Italy. According to Wikipedia, the stories of his expulsion by the Franks, whose women he was taking; of his eight-year stay in Thuringia with King Basin and his wife Basina; of his return when a faithful servant advised him that he could safely do so by sending to him half of a piece of gold which he had broken with him; and of the arrival in Tournai of Queen Basina, whom he married, come from Gregory of Tours' Libri Historiarum (Book ii.12). Childeric's tomb was discovered in 1653 (May 27) by a mason doing repairs in the church of Saint-Brice in Tournai, a city in modern Belgium. Numerous precious objects were found, including a richly ornamented sword, a torso-like bracelet, jewels of gold and cloisonné enamel with garnets, gold coins, a gold bull's head and a ring with the inscription CHILDERICI REGIS ("of Childeric the king"), which identified the tomb. Some 300 golden bees were also found. The treasure went eventually to Louis XIV, who merely stored them in the royal library -- which became the Bibliothèque Nationale de France during the Revolution. Napoleon was sufficiently impressed with Childeric's bees, that when he was looking for a heraldic symbol to trump the Bourbon fleur-de-lys, he quickly settled on Childeric's bees as symbols of the French Empire. The bee had been chosen to link the new dynasty to the very origins of France, and as such they were considered to be the oldest emblem of the sovereigns of France. It should be noted that Golden bees or flies are a pagan symbol representing longevity or the cult of Artemis. On the night of November 5–6, 1831, the treasure of Childeric was among 80 kilos of treasure stolen from the Library and melted down for the gold. A few pieces were retrieved where they had been hidden in the Seine, including two of the bees. The record of the treasure, however, now exists only in the fine engravings made at the time of its discovery, and in some reproductions made for the Hapsburg (who had been the first to recover the treasure... just prior to sending the treasure to Louis XIV as a gift. Lord Ferreolus of Moselle was born (c. 478) in Moselle, Austrasia, France. His parents were Bishop Sigimaerus I of Auvergne and Tonantius. Duchess Dinteria of Moselle was born in 504 in Moselle, Austrasia, France. She was also known as Duchess Outeria of Moselle. Clovis I (c. 466-511) was the first King of the Franks to unite all the Frankish tribes under one king. He also brought them Christianity. Hey... You win a few; you lose a few. Sigh. Clovis I , at age 16, succeeded his father Childeric I in 481 as King of the Salian Franks, one of the Frankish tribes who were then occupying the area west of the lower Rhine. The area was centered around Tournai and Cambrai along the modern frontier between France and Belgium, in an area known as Toxandria. [Toxandria is the classical name for a region between the Meuse and the Scheldt rivers in the Netherlands and Belgium. The Salian Franks that settled the area in the 4th century became known as Toxandrians. These tribes gave rise to the Merovingian dynasty that came to dominate what is now Belgium and France.] An early Halexandria? Clovis conquered the neighboring Frankish tribes and established himself as sole king before his death. Not leaving well enough alone, he converted to Chalcedonian Christianity, as opposed to the Arian Christianity common among the Germanic peoples at the time. In effect, Clovis had thereby aligned himself with the Church at the instigation of his wife, the Burgundian Clotilde, a fire-breathing Catholic. Clovis was baptized in a small church which was on or near the site of the Cathedral of Rheims, where most future French kings would be crowned. This act was of immense importance in the subsequent history of Western and Central Europe in general, because Clovis I had expanded his dominion over almost all of the old Roman province of Gaul (roughly modern France). He is therefore considered a critical link in the Merovingian dynasty, which would rule the Franks for the next two centuries. Clovis' name is spelled in a number of variants, including the Latin name Ludovicus (as opposed to Ludicrous), which evolved into the French form of Louis. Three other Merovingian Kings have been called Clovis, while nine Carolingian rulers and thirteen other French kings and one Holy Roman Emperor have been called Louis (aka Clovis). Nearly every European language has developed its own spelling of this name. Louis (French), "Chlodwig" and Ludwig (German), Lodewijk (Dutch), Luis (Spanish), Luigi (Italian), and Lewis (English) are just six of the over 100 possible variations. This broad collection on names also suggests a commonality in thinking of Clovis I as the founder of multiple dynasties. The conversion of Clovis to Catholic Christianity strengthened the bonds between his Roman subjects, led by their Catholic bishops, and their Germanic conquerors. Nevertheless, this conversion from his Frankish paganism may have alienated many of the other Frankish sub-kings and weakened his military position over the next several years. According to Wikipedia, the term Paganism (from the Latin paganus, meaning "country dweller", "rustic") is a blanket term used to refer to various polytheistic, non Judeo-Christian religious traditions. It is primarily used in a historical context, referring to Greco-Roman polytheism as well as the polytheistic traditions of Europe before Christianity. In a comparative sense, extended to contemporary religions, it includes most of the Eastern religions, and the indigenous traditions of the Americas, Central Asia and Africa, as well as non-Abrahamic folk religion in general. More narrow definitions will not include any of the world religions and restrict the term to local or rural currents not organized as civil religions. Characteristic of pagan traditions is the absence of proselytism and the presence of a living mythology which explains religious practice. The term "pagan" is sometimes considered to be a Christian adaptation of the "gentile" of Judaism, and as such has an inherent anti-Abrahamic bias, and pejorative connotations among Western monotheists, comparable to heathen and infidel. For this reason, ethnologists avoid the term "paganism," with its uncertain and varied meanings, in referring to traditional or historic faiths, preferring more precise categories such as polytheism, shamanism, pantheism, or animism. In the "interpretatio romana," Gregory of Tours gave the Germanic gods that Clovis abandoned the names of roughly equivalent Roman gods, such as Jupiter and Mercury. Taken literally, such usage would suggest a strong affinity of early Frankish rulers for the prestige of Roman culture, which they may have embraced as allies and federates of the Empire during the previous century. There is also the distinct possibility that more than one queen or princess wanted to do some shopping for the latest fashions in Roman malls and shopping centers... i.e., the real “prestige of the Roman culture” that was being sought, was being sought primarily by the women. Though he fought a battle at Dijon in the year 500, Clovis did not successfully subdue the Burgundian kingdom. It appears that he somehow gained the support of the Arvernians in the following years, for they assisted him in his defeat of the Visigothic kingdom of Toulouse in the Battle of Vouillé (507) -- a battle which eliminated Visigothic power in Gaul and confined the Visigoths to Hispania and Septimania. The battle added most of Aquitaine to Clovis' kingdom. He then established Paris as his capital, and established an abbey dedicated to Saints Peter and Paul on the south bank of the Seine. Later it was renamed Sainte-Geneviève Abbey, in honor of the patron saint of Paris. Upon his death Clovis’ greatly expanded realm was divided among his four sons: Theuderic, Chlodomer, Childebert, and Clothar (Lothar I). This partitioning created new political units of the Kingdoms of Rheims, Orléans, Paris and Soissons and inaugurated a period of disunity which was to last, with brief interruptions, until the end (751) of the Merovingian dynasty. If there is anything that can be learned from inheritances is that the dilution of family wealth and power to the benefit of more than one heir is almost always problematic. Conversely, the later English tradition of leaving everything to the oldest son... period... tended to be problematic for the other siblings. Sigh. Clovis is remembered for three main accomplishments: his unification of the Frankish nation, his conquest of Gaul, and his conversion to the Roman Catholic Faith. By the first act, he assured the influence of his people beyond the borders of Gaul, something no petty regional king had ever accomplished. By the second act, he laid the foundations of a later nation-state: France. Finally, by the third act, he made himself the ally of the papacy and its protector... which the Papacy could really use. Detracting from this legacy is his division of the state to his four sons -- not along national or even largely geographical lines -- but primarily to assure equal income amongst his sons on his death. It may or may not have been his intention -- it could have, for example, been a curious experiment in survival of the fittest son (may the strongest prevail... instead of arbitrarily selecting one based on their kowtowing abilities). But he nevertheless ensured a great deal of internal discord in Gaul. This precedent led in the long run to the fall of his dynasty, for it was a pattern repeated in future reigns. Clovis did bequeath to his heirs -- for better or worse -- a church alliance that, when finally the magnates were ready to do away with the royal house, the sanction of the Pope was sought first. Of course, with the Papacy being the least reliable ally in the history of any empire, this pretty much doomed the dynasty to oblivion... accept for a few descendants to came about their DNA in curious and fascinating ways. The distinction between Chalcedonian and Arian Christianity is important. 1. Jesus Christ is described as "God from God, Light from Light, true God from true God," confirming his divinity. When all light sources were natural, the essence of light was considered to be identical, regardless of its form. 3. Finally, he is said to be "from the substance of the Father," in direct opposition to Arianism. Some ascribe the term Consubstantial, i.e., "of the same substance" (of the Father), to the king, Constantine who, on this particular point, may have chosen such a creed in order to exercise his own curious form of authority. Opposed to the Nicene Creed was Arias and his followers (the Arians)... who believed that the Son, though he may be the most perfect of creations, was only a creation. Much of the debate in fact hinged on the difference between being "born" or "created" and being "begotten". Arians saw these as the same; followers of the Nicene Creed did not. Indeed, the exact meaning of many of the words used in the debates at Nicaea were still unclear to speakers of other languages... thus making the outcome of the debate to be somewhat predicable. According to Gardner [ibid], at the time of Clovis’ victories over Syagrius, the Roman Church greatly feared the increasing popularity of Arianism in Gaul. Catholicism was dangerously close to being overrun in Western Europe, where the majority of active bishoprics were Arian. Fortunately for the Church, Clovis was neither Catholic nor Arian. It therefore occurred to the Roman hierarchy that the rise of Clovis could be used to their advantage. As it transpired, Clovis aided them quite inadvertently when he married the Burgundian Princess Clotilde. Although the Burgundians were traditionally Arian in their beliefs, Clotilde was herself a Catholic, and she made it her business to evangelize her version of the faith. For a time she had no success in promoting the doctrine to her husband, but her luck changed in 496. In the midst of a losing battle with an invading Alamanni, Clovis invoked the name of Jesus... at which point the Alaman king was slain, and the Alamanni faltered and fell into retreat. Clotilde afterwards wasted no time in claiming Jesus as the cause of the Merovingian victory. Clovis was not especially convinced of this, but his wife sent immediately for St. Remy, Bishop of Rheims, and arranged for Clovis to be baptized. Roughly half of the Merovingian warriors followed Clovis’s “conversion”, and soon word had spread that the high potentate of the West was a Catholic. This yielded a great wave of conversions, and the Roman Church was effectively saved from an almost inevitable collapse. In fact, were it not for the baptism of King Clovis, the ultimate Christian religion of Western Europe might well now be Arian rather than Catholic. However... the royal compliance was not a one-way bargain: in return for the king’s agreement to be baptized, the Roman authorities pledged an allegiance to Clovis and his descendants. They promised that a new “Holy Empire” would be established under the Merovingians. Clovis had no reason to doubt the sincerity of the Roman alliance -- but he unwittingly became the instrument of a bishops’ conspiracy against the Messianic bloodline (aka the Desposyni). This “binding agreement” by the Catholic Church lasted for about 184 years (496 to 680), when Pepin the Short murdered Dagobert III (the last of the Merovingian royal line), and for the assassination, received the blessing of the Roman Church. Audofleda was the daughter of Childeric I, and sister to Clovis I. Clovis allied the Franks with the Goths (Ostrogoths) in 492 by marrying Audofleda to their king, Theodoric the Great. The plan was to create a permanent reconciliation between the Goths and the Romans in the person of a Gotho-Roman Emperor. Amalasuntha was, in turn, married to Eutharic and had two children: Athalaric and Matasuentha. The latter was married to Witiges first, and then, after Witiges' death, married to Germanus Justinus. However, neither had children... thus shattering any useful family lineage. After his death in Ravenna in 526, Theodoric was succeeded by his grandson Athalaric. Athalaric was at first represented by his mother Amalasuntha, who was a regent queen from 526 until 534. The kingdom of the Ostrogoths, however, began to wane and was conquered by Justinian I starting after the rebellion of 535 and finally ending in 553 with the Battle of Mons Lactarius. Alas... yet another dead end... pardon the pun. Lothar I (Chlothar, Chlotaire, Chlothachar, Chlotar, Clothar, Clotaire, Chlotochar, or Hlothar, giving rise to Lothair; 497 – 561) was called the Old (le Vieux), King of the Franks. He was born about 497 in Soissons (now in Aisne département, Picardie, France). On the death of his father, Clovis I, in 511, he received, as his share of the kingdom, the town of Soissons, which he made his capital; the cities of Laon, Noyon, Cambrai, and Maastricht; and the lower course of the Meuse River. But he was very ambitious, and sought to extend his domain. Theuderic defeated. (c. 532). She was later canonized. Lothar I was the chief instigator of the murder of his brother Chlodomer's children in 524, such that his share of the spoils consisted of the cities of Tours and Poitiers. He took part in various expeditions against Burgundy and, after the destruction of that kingdom in 534, obtained Grenoble, Die, and some of the neighboring cities. When the Ostrogoths ceded Provence to the Franks, he received the cities of Orange, Carpentras, and Gap. In 531, he marched against the Thuringii with his nephew Theudebert I and in 542, with his brother Childebert I went against the Visigoths of Spain. On the death of his great-nephew Theodebald in 555, Lothar annexed his territories. On Childebert's death in 558 he became sole king of the Franks. Lothar also ruled over the greater part of Germany, made expeditions into Saxony, and for some time exacted from the Saxons an annual tribute of 500 cows. The end of his reign was troubled by internal dissensions, his son Chram rising against him on several occasions. Following Chram into Brittany, where the rebel had taken refuge, Lothar shut him up with his wife and children in a cottage, which he set on fire. [Nice! One of those father-son bonding activities.] Overwhelmed with remorse, he went to Tours to implore forgiveness at the tomb of St Martin, and died shortly afterwards. Chilperic I [King Chilperic I of Neustria at Soissons] (c. 539 – September 584) was the king of Neustria (or Soissons) from 561 to his death. [According to Ancestry.com, he was “Mudered.” <grin>] He was one of several sons of Lothar I, sole king of the Franks, and the son of Aregund (Lothar’s fourth wife). Chilperic, immediately after the death of his father in 561, endeavored to take possession of the whole kingdom, as he seized the treasure amassed in the royal town of Berny and entered Paris. His brothers, however, compelled him to divide the kingdom with them, and Soissons, together with Amiens, Arras, Cambrai, Thérouanne, Tournai, and Boulogne fell to Chilperic's share. His eldest brother Charibert received Paris, the second eldest brother Guntram received Burgundy with its capital at Orléans, and Sigebert I received Austrasia. On the death of Charibert in 567, his estates were augmented when the brothers divided Charibert's kingdom among themselves and agreed to share Paris. Not long after his accession, however, Chilperic was at war with Sigebert, with whom he would long remain in a state of -- at the very least -- antipathy. Sigebert defeated him and marched to Soissons, where he defeated and imprisoned Chilperic's eldest son, Theudebert. The war flared in 567, at the death of Charibert. Chilperic immediately invaded Sigebert's new lands, but Sigebert defeated him. Chilperic later allied with Guntram against Sigebert (573), but Guntram changed sides and Chilperic again lost the war. This murder, besides being the stuff blissful weddings are made of (“something borrowed, someone dead...”) was the cause of more long and bloody wars, only occasionally interspersed with truces... all between Chilperic and Sigebert. In 575, Sigebert was assassinated by Fredegund at the very moment when he had Chilperic at his mercy. [Ah... the duties of the very faithful wife.] Chilperic then made war with the protector of Sigebert's wife and son, Guntram. Chilperic retrieved his position, took from him: Austrasia, Tours, and Poitiers, and some places in Aquitaine, and fostered discord in the kingdom of the east during the minority of Childebert II. Chilperic was detested by Gregory of Tours, who dubbed him as the Nero and Herod of his time. He had provoked Gregory's wrath by wresting Tours from Austrasia, seizing of ecclesiastical property, and appointing as bishops, counts of the palace who were not clerics. [Thus making it pretty clear the cause of Gregory’s animosity.] Chelperic’s reign in Neustria also saw the introduction of the Byzantine punishment of eye-gouging. Yet, he was also a man of culture: he was a musician of some talent, and his verse is well-regarded; he reformed the Germanic alphabet; and he worked to reduce the worst effects of Salic law upon women. One might even say that he had an eye for women... or a rather large supply of eyes for (and from) women. It was one day in September of 584, while returning from the chase to his royal villa of Chelles, that Chilperic was stabbed to death. Not exactly a shocker. More like a sudden penetration. King Chilperic wrote a little treatise to the effect that the holy Trinity should not be so called with reference to distinct persons but should merely have the meaning of God, saying that it was unseemly that god should be called a person like a man of flesh; affirming also that the Father is the same as Son and that the Holy Spirit also is the same as the Father and the Son. "Such," said he, "was the view of the prophets and patriarchs and such is the teaching the law itself has given." When he had had this read to me he said: "I want you and the other teachers of the church to hold this view." But I answered him: "Good king, abandon this belief; it is your duty to follow the doctrine which the other teachers of the church left to us after the time of the apostles, the teachings of Hilarius and Eusebius which you professed at baptism." Ah, yes... “the teachings of Hilarius”! You just got to love the irony! Senator Ansbert of Moselle (c. 522-570) was born in Old Saxony, Germany. His parents were Lord Ferreolus of Moselle and Duchess Dinteria of Moselle. Married: Queen Blitidis of Kent. Children: Margrave Arnoldus of Scheldt. Not a lot is known about Ansbert, other than his opportunistic marriage to Blitidis and which provided an important link between the Merovingian line of descent from Lothar I... and the older brother’s line with Sigimaerus I’s lineage. Queen Blitidis of Kent (b. c. 530) was also known as Queen Aldeberge of Kent, and/or Queen Berthe of Kent. Her parents were King Lothar I and Ingund. Blitidis, being a female, didn’t get a lot of press. But then, inasmuch as waging wars, selling bishoprics, and ignoring the views of Hilarius, et al... were the primary ways to getting noticed in those days, it stands to reason that Blitidis was not in the best position to gather notoriety. And yet, this shy little female devil did initiate a very interesting, parallel line to that of Meroveus’... and in the final analysis, made a huge difference. Blitidis’ marriage to Ansbert was noteworthy in that the marriage connected two distinct lines from Clodion, Lord of Tournai, and Queen Basina: one via Sigimer, who married a daughter of the Roman Senator, Ferreolus; and one via Meroveus (the line we’ve been following). Ansbert was Sigimer’s grandson (via Ferreolous, Lord of Moselle, and a Roman woman, Dinteria). Lothar II, Lothar the Great (le Grand), or the Young (le Jeune) was the son of King Chilperic I of Neustria at Soissons and Queen Fredegund Regent of Neustria at Soissons. Lothar II became King of Neustria, Austrasia, and Burgundy at birth (c. 584), inasmuch as he was not yet born when his father, died. From 613 to 629, he was King of all the Franks. [King Lothar II of the Franks] His mother, Fredegund, was regent until her death in 597, at which time the thirteen-year-old Lothar began to rule for himself. As king, Lothar II continued his mother's feud with Brunhilda, queen of Austrasia, with equal viciousness and bloodshed. In 599, he made war with his cousins, Theuderic II of Burgundy and Theudebert of Austrasia, who defeated him at Dormelles (near Montereau). At this point, however, the two brothers took up arms against each other. In 605, he invaded Theuderic's kingdom, but did not subdue it. He remained often at war with Theuderic and the latter died in Metz in late 613 while preparing a campaign against him. At that time, Warnachar, mayor of the palace of Austrasia, and Rado, mayor of the palace of Burgundy, abandoned the cause of Brunhilda and her great-grandson, Sigebert II, and the entire realm was delivered into Lothar's hands. Brunhilda and Sigebert met Lothar's army on the Aisne, but the Patrician Aletheus, Duke Rocco, and Duke Sigvald deserted the host and the grand old woman and her king had to flee. They got as far as the Orbe, but Lothar's minions caught up with them by the lake Neuchâtel. Both of them and Sigebert's younger brother Corbo were executed by Lothar's orders. In 615, Lothar II promulgated the Edict of Paris, a sort of Frankish Magna Carta that reserved many rights to the Frankish nobles while it excluded Jews from all civil employment for the Crown. [And like the Magna Carta, it was less the generosity of the king, than the growing power of the nobility to control errant kings.] The ban effectively placed all literacy in the Merovingian monarchy squarely under ecclesiastical control and also greatly pleased the nobles, from whose ranks the bishops were ordinarily exclusively drawn. Lothar was induced by Warnachar and Rado to make the mayoralty of the palace a lifetime appointment at Bonneuil-sur-Marne, near Paris, in 617. By these actions, Lothar lost his own legislative abilities and the great number of laws enacted in his reign are probably the result of the nobles' petitions, which the king had no authority not to heed. In 623, Lothar II gave the kingdom of Austrasia to his young son Dagobert I, aka Dagobert the Great (albeit, he was not yet so named). This was a political move as repayment for the support of Bishop Arnulf of Metz and Pepin I, mayor of the palace of Austrasia, the two leading Austrasian nobles, who were effectively granted semi-autonomy. Arnulf was, interestingly enough, someone we will soon encounter, in the form of Blitidis’ grandson. Pepin I was the son of Carolman of Brabant, and would soon make his heir’s impact upon the Merovingians. It is in fact, perhaps worth noting, that the extensive in-fighting among the primary line of the Merovingians -- continual wars, assassinations, tortures, and so forth -- had begun to take their toll. The Nobles had had to grab the reigns (so to speak) and establish alternative lines of power and lineages... albeit Arnulf was also a descendant of Meroveus (through his maternal grandmom). Lothar II died in 629 after 45 years on the throne, longer than any other Merovingian dynast save for his grandfather Lothar I, who ruled from 511 to 561. He left the crown greatly reduced in power and prepared the way for the rise of the mayors and the rois fainéants. Margrave Arnoldus of Scheldt (c. 562-601) was born in Metz, Austrasia. His parents were Senator Ausbert of Moselle and Queen Blitidis of Kent. Arnoald was clearly a key noble in the succession lines... but in the precise manner in which he was doing so... that’s a bit less clear. Let’s just say, his son, Arnulf... along with Pepin I were destined to take Lothar II down a peg or two. Possibly three or four. But this tale, alas, must be related in the subsequent installment of the MOAFT.